SÃO PAULO, BRAZIL – The Brazilian National Monetary Council passed a resolution last week which will direct R$22.5 billion of reserve requirements towards farm and housing credit. The measure, say analysts, will help sectors such as the construction and real estate segments, which have been hit hard by the country’s sluggish economy. Construction costs dropped in July yet still remain high as the construction market hits a slump, photo by Ignacio Ferreira/ImprensaRJ. Under the new measure, banks will have to increase their reserve requirements on saving deposits from twenty percent to 24.5 percent to be used towards housing credit. 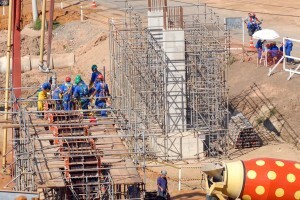 “The aide to housing credit shows that the government has decided to help out the sectors,” said José Carlos Martins, president of the Brazilian Construction Industry Chamber (CBIC) in an interview to Agencia Brasil. Since the beginning of the year Brazil’s federal government has tightened housing credit to consumers, and the government-run financial institution, Caixa Economica Federal, responsible for seventy percent of all housing credit in the country, reduced the financing limit for those wishing to purchase used housing units from 80 to 50 percent of the total value of the unit. Prices for real estate are also suffering. According to the Fipe-Zap index real estate prices across Brazil have fallen by 3.70 percent in real prices (when prices increase below inflation) from January through May of 2015. In the twelve-month period ending in April, prices have increased by an average of 4.91 percent, below inflation for the same period (8.17 percent). A survey conducted by news radio station CBN, based on data from the Labor Ministry, shows that 2015 has registered the worst April in ten years in the housing sector. Analysts say that although the measures will not increase the volume of credit available in the economy, they will direct more of the total volume towards these credit lines. With more credit available government officials and sector analysts hope to attract more consumers, thus increasing activity in the real estate sector and consequently supporting activity in the construction segment.